Launch the Lifeboat is a spectacularly unique children's book with detailed illustrations. In this captivating tale you’ll find yourself caught up on the stormy sea with an old fisherman as he tells the story of a dreadful night that a ship was ripped apart by relentless waves. The sound of a bell just above the howl of the wind and the crashing of the waves can only mean one thing for Jonah and the men on the shore—they must launch the lifeboat and save those perishing aboard the sinking ship. Through this storm and the waves of life, Jonah discovers that those rescued from the ship are not the only ones God intends to save. 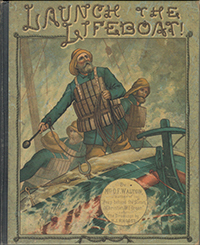 Launch the Lifeboat Illustrated is part of the Children's Collection. From Jeana Bigelow of Taylors, South Carolina on 9/12/2016 . Our family greatly enjoyed hearing this story over a couple of evenings. The youngest were as engaged as the oldest (4-13 years). The story is captivating and such a wonderful example of what really matters in life. From Mary of The Panhandle, Idaho on 9/3/2016 . Beautifully illustrated book and a wonderful read aloud to your little ones! Great book to introduce a wonderful collection of literature from Lamplighter. From Marlene Graham of Mesa, Arizona on 8/14/2016 . Another great book. It has an old time feel with the paper and text and that would make it a treasure in itself but then you get the awesome illustrations as well. A must add to your library if you can. Loved the message! The Lord Saves!! !